Over 50 years experience. Serving New Hampshire since 1972. New home for our club! We're proud to announce that as of October 2017, 9th Degree Black Belt Karate Grandmaster Peter Rose is offering his 50+ years of expertise teaching the martial arts in New Durham, New Hampshire. Master Rose retired as a senior software engineer, and moved from the Seacoast of New Hampshire into a beautiful 1775 antique cape in New Durham in March of 2017. While he continues to teach selected classes in the Seacoast area through some of the local programs his advanced students operate, Master Rose offers training in New Durham to adults 16 years of age and up. Sorry, but because Master Rose only trains adults, there are no classes for children. Master Rose uses modern, progressive, and safe educationally sound principles in his teaching. Because there is no training for competition, nor is sparring part of the regular curriculum, students of all physical abilities are welcome. This is not to say the training is easy. It is far from that. It is demanding, but rewarding, as evidenced by the fact that Master Rose has many current students who have been training with him for 15, 20, and even over 30 years. Class size is small; usually only a few students. Master Rose chooses not to teach commercially, but rather for just a small group of seriously motivated adults who seek a calm, relaxed, and thoughtful approach to their training. To qualify for training, candidates must have no criminal record, or have any current drug or alcohol issues. Our main class currently meets on Thursday evenings from 7:00 pm to 8:30 pm. Other classes and training are scheduled both on a rotating and on an as needed basis. We can offer this flexibility because we're not a commercial organization. We can do pretty much what our students need us to do. Master Rose works personally with new students on a private basis for their initial training. There are no contracts or commitments. To get a full understanding of what we do, Master Rose will meet privately with you, and answer any questions you may have about our training methodology. For more information, please email Master Rose at: RoseKarate@tds.net. Who needs it? Today, we live in a fast paced world which often forgets what is truly important. In this environment, one often feels the need for a fresh sense of self confidence, dignity, and self respect. Karate attempts to instill in its practitioners these ideals along with physical development and mental well being. As students of Karate, we study an art which teaches us self defense. 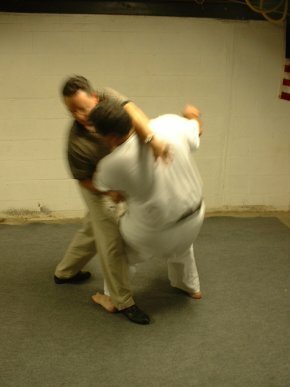 With the knowledge of self defense, we are more at ease in our environment and with ourselves. We don't feel the need to prove ourselves, because we are secure in our ability to defend ourselves. Gichin funakoshi, who is considered the Father of modern day karate, said it best: "The ultimate goal lies not in winning a thousand battles, but in avoiding a single conflict." Peter Rose was born in Chicago, Illinois in 1949. He began his training in the Martial Arts in September of 1968 at the age of 19 in Shudokan Karate under the National Karate Association while attending Eastern Illinois University in Charleston, Illinois. He was promoted to Certified 1st Degree Black Belt in Shudo-Kan Karate from National Karate Association Grandmaster S.A. Brock in 1970. After graduating with a Bachelor of Science Degree in Physics in June of 1972, Mr. Rose moved to New Hampshire and, after operating informerly in some corn fields in Madbury, NH, opened the Rose School of Karate in Portsmouth, NH on October 24, 1972. He received further promotions in St. Louis, MO during annual week long visits for advanced training. After receiving his 5th Degree Black Belt Masters ranking in June of 1976, Master Rose was made Senior Vice-President and Senior Board Member of the National Karate Association. On October 4, 1986, he received his 7th Degree Black Belt from 9th Degree Black Belt Grandmaster S.A. Brock, and was made responsible for all promotions and testing requirements, and policy standards for the National Karate Association. 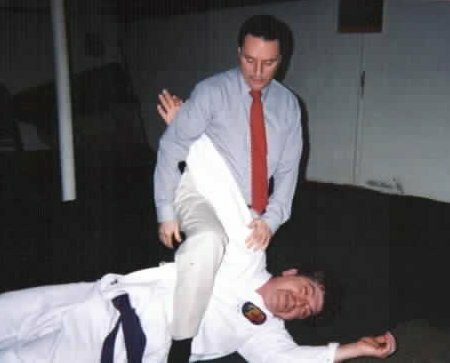 In May of 1992, Mr Rose was awarded the title of Grandmaster in the C&S Self Defense Association, and in 1994 was promoted to the rank of 8th Degree Black Belt. 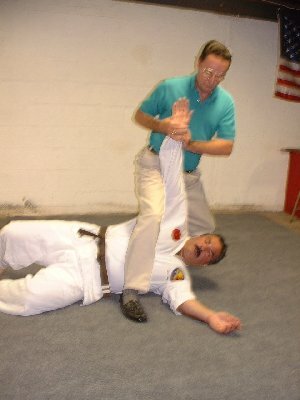 In May of 2006, after training with the cane since 2003, Mr. Rose tested for and received his Black Belt in Cane Masters International from Black Belt Hall of Fame Grandmaster Mark Shuey, Sr. In May of 2007, Grandmaster Rose was promoted to 9th Degree Black belt, and assumed the role as the Senior Grandmaster on the C&S Self Defense Association Governing Council. Nominated by his Disciples, Grandmaster Rose was inducted into the United States Martial Arts Hall of Fame as a Grandmaster through the International Martial Arts Council of America on 07/20/2013. Grandmaster Rose retired in 2015 after a 33 year career as a senior software engineer, analyst, and designer of complex web based business applications. In March of 2017 he moved from Dover, NH into a beautiful 1775 antique cape in New Durham, NH where he continues his obligation of sharing the martial arts with both former and new students. He follows and teaches his students the basic Hopi principle of life: "Seek the way to conduct our lives in friendship and peace, without anger, without greed, without wickedness of any kind, among ourselves or in our association with any people." His interests are diverse and span martial arts, software applications design and development, sailing, reading, business, writing, currency trading, real estate, cooking, backgammon, history, philosophy, psychology, meditation, and science. Along with his responsibilities in the martial arts, he also trades foreign currencies and provides training and mentoring through his firm Longwood Currency Trading. The Rose School of Karate has the finest program of self defense, coordination, fulfillment, fitness, flexibility, and strength building instruction that can be found anywhere in the world. Although the type of karate that we teach has its roots going back centuries to China, our presentation is modern. We are Americans and proud of our heritage of assimilating all of the good things the world has to offer and then making it better. Though we teach discipline and respect, we do it in a Western manner rather than Oriental. Our Americanized approach to the martial arts has been honed to perfection since the late 1950s. We do it better because we are not trapped in traditional styles of martial arts where following the way it was done for centuries is the only way to do it. We look carefully at everything we teach, constantly molding it to make it easier for the student to grasp and perform. In fact, we have a general review of our entire physical curriculum every year and an overall view of everything the association does every 5 years. 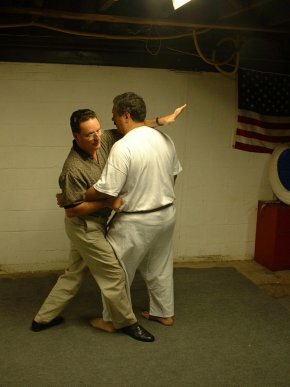 All of this is done under the guidance and leadership of the Governing Council of C&S Self Defense Association, each member having a minimum of 20 years experience. We have a lot of expertise guiding us and providing our students with the highest quality of martial arts instruction anywhere in the world. At the Rose School of Karate, our emphasis is to provide a calm, safe, and enjoyable environment to learn in. We pride ourselves on our ability to teach practical skills that anyone can learn and benefit from. Our educationally sound and scientifically proven instructional methods will show you how you can become the well rounded person you want to be. We follow and teach the basic Hopi principle of life: "Seek the way to conduct our lives in friendship and peace, without anger, without greed, without wickedness of any kind, among ourselves or in our association with any people." Though Grandmaster Rose had a formal karate school in Portsmouth, NH for over 20 years with well over 100 students, he opted to close it and all of its commercial aspects in order to focus on just a small group of students. He currently teaches in New Durham, NH, though senior students of his hold classes in Portsmouth, Durham, and Laconia, NH, and in Kittery, ME. New students are welcome, but limited to just a few a year. Students must be at least 16 years of age, have no criminal background, or any drug or alcohol dependancy. For more information, use the email address in the header of this page. I look forward to chatting with you and in answering any questions you may have! I started the Rose School of Karate immediately after moving out to New Hampshire in August of 1972. I had just graduated with a B.S. in physics from Eastern Illinois University and had come out to attend graduate school in physics at the University of New Hampshire in Durham, NH. I rented a beat up old trailer at 8 Grande Hill Mobile Home Park in Madbury, NH, and would train by myself under the rather dim street light at the end of the little road I was on. I met my first student out here, Paul Dusenbery who was also a first year graduate student at UNH, and we started training together and getting others involved. 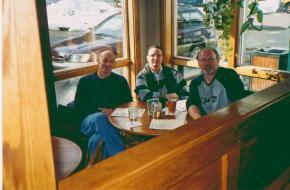 Duesnbery remained my student until 2005 when he formed his own association with all of his disciples. We started with just a couple of us pushing the furniture around in my small trailer, but as the group grew to a half dozen we had to move class outside into one of the rural fields nearby. As Fall came and the New England weather closed in, it became too wet and cold to continue outside. As I looked for a place to rent, we found a temporary home in the basement of one of the university's frat houses. I officially opened the Rose School of Karate at 8 Bow Street in Portsmouth, NH on October 24, 1972. Around 1978, we moved to the building I eventually bought at 124 Congress Street. The club flourished in the heart of downtown Portsmouth until around 1995 when my "day job" as a senior software developer required more time than I had to run a full time business as I was now commuting to Peabody, MA. Since then, I have continued on with a small dedicated group working out in many different locations in the immediate Seacoast area of New Hampshire. Many of my students have started small programs of their own as well, and offer training in Portsmouth, Durham, and Laconia, NH, and in Kittery, ME. In 2017, after retiring as a senior software engineer, the Rose School of Karate continues on in New Durham, NH. 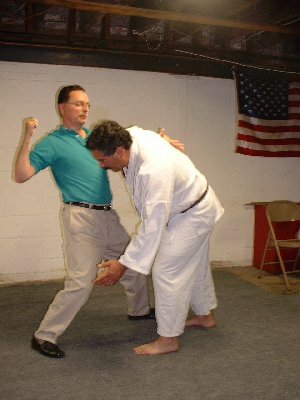 Rick Downs, Jim Mason, and Scott Williams of the Rose School of Karate in October of 2001 studying the Spinning Upright Mule Kick. The Rose School of Karate is not a commercial school. We are a small club of like thinking people all working toward the same basic goals. Classes are very small and are all taught by Grandmaster Rose. Beginners are worked with on an individual needs basis. Personal attention, qualified and certified instructors all in an environment of positive thinking and growth. Over 50% of class time is devoted to the instructor working almost one on one with each student to make certain your needs are being met. We are not a competition oriented club. We do not teach karate for entertainment. We teach karate as a martial art, a life enhancing pursuit accomplished by confidence in the self gained through knowledge of personal self defense and awareness. To give you an example of what I am talking about, neither of my two children were really interested in martial arts training, and I never pushed it at them. However, my son, Colin, ran into a bully at school when he was about 10 years old. This kid just kept getting worse and worse, and Colin is such a nice kid that he just took it. But when the bullying turned to hitting and kicking, that was it for Colin - and me. So over one school Easter break, I worked with both of them for about a week teaching them the specialized self defense program that I teach to all new students. Colin went back to school and a few days later the kid started in on him again and kicked at him really hard. Colin dropped him cold. Colin has never had to fight again, nor to my knowledge has anyone ever pushed him. He just knows that he can handle himself, and never gives off that victim look that makes a lot of folks targets for abuse. This is the reason that I teach the way that I do. Sparring and tournaments are fine for those who seek that sort of sport aspect, but we look at that as really just entertainment. 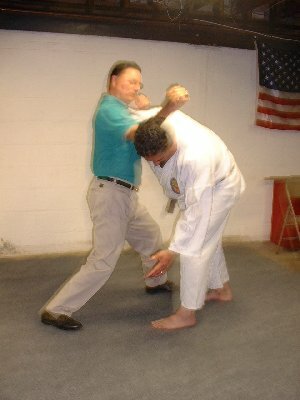 I feel that the key aspects of a valid study is to learn power dispersion theory and application, centeredness through forms, technical awareness through basics, and confidence in ones ability to defend oneself through practice of a practical methodology where the emphasis is on learning and gaining technique rather than fear fighting. Learning to simply spar does not build in the technical skills one needs in order to carry through ones life the basic core self defense ability. This is a critical flaw in many karate programs, unfortunately. But that is why serious folks are willing to travel sometimes pretty fair distances to train under me. 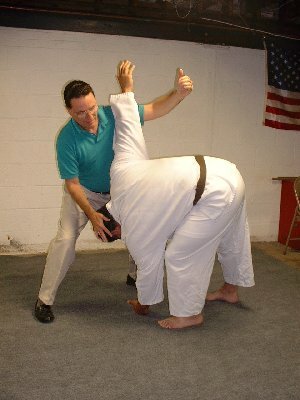 I always teach my students to defend themselves first, and then I teach them the karate through a gradually increasing and challenging series of drills and exercises. It is a much more satisfying process for the student. In this manner, the student begins to realize that they are learning something retainable and directly applicable as life changing and enhancing concepts and abilities. Great stuff and great fun! I hope this interests you, and that you become involved in our program. You will succeed and realize the great internal satisfaction that comes with good training. What I teach is truly life altering in such a positive sense, particularly for the older student whose needs vary radically from than those of younger students who are initially looking for the thrill of the training and not beyond. Most of the pictures we have taken since 1972 are displayed on the walls of the club. But our students thought that our website should have a section of pictures as well, even though we are usually too busy working out to be taking pictures! I rearranged the format of the site at the start of 2003 and added this section showing some shots taken at my November 2002 Disciple Retreat in New Hampshire's White Mountains. This seemed to be a fitting start to our online picture gallery. Each year, my direct disciples from all across the country gather together for 3 days with me. It is a time of reflection and grounding. A time to come together and discuss progress on assignments from the last year. It is a time to exchange ideas and techniques with each other so that we can all grow. And it is a time for me to meet individually with each disciple - most training with me for 15 years or more, several 30 plus years - to set goals and study outlines for the coming year. It is an intense period, but - as the pictures show - that doesn't keep us from having fun while we work. Of course, it's not everyone's idea of a good time to be working from 7:30 am until 2:00 am the following morning. But we do have fun! The links below are a combination of retreats, exams, or other events our club has participated in. 06/16/2006: Grandmaster Rose presented with custom Canemasters cane. Hi, I'm Peter Rose, head instructor of the Rose School of Karate in New Durham, NH. I'm a retired senior business applications software engineer currently trading foriegn currencies through my firm Longwood Currency Trading. 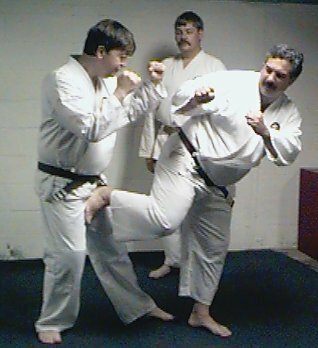 My full karate bio can be viewd on the C&S Self Defense Association web site, or get my whole life's story on my personal home page. I have been training in martial arts since 1968 and know of no other form of activity that so intimately relates body and mind together. I was initially drawn to karate for its self defense and confidence building. But I soon saw a much broader picture- a picture that I have devoted my entire life to expanding. I truly work at my craft from the time I get up in the morning until the time I get up the next morning. But you don't have to be that committed! I have just found something that answered a lot of problems for me and I have stuck with it. You are welcome to share whatever part of that experience that you may choose with me for however long you choose to do so. But what's it really all about? First of all, I don't teach karate for competition or for "show". I teach a serious analysis of the physical and psychological aspects of martial arts. Not everyone will want to study with me, nor could everyone qualify. I teach serious adults and young adults only. I am less concerned with your physical ability as I am with your desire to learn. My class size is very small. 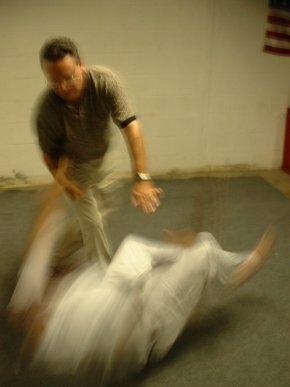 We practice our fundamental material - what the C&S Self Defense Association terms its "core" material: that material which is critical to the development of coordinated and healthy body systems. I promise to keep you busy. 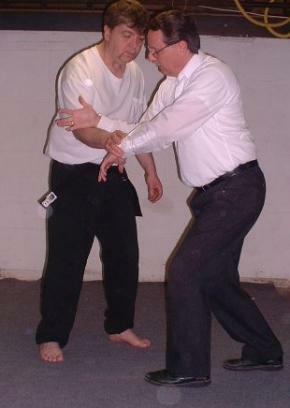 Grandmaster Rose demonstrating the "Leveraged Takedown" self defense technique against black belt Scott Williams. Most karate schools are willing to "entertain" you several nights a week. But I just don't see it that way. The reason you will come to study with me is to learn and get good. I will teach you how to do that. Your job is to then go work on this material at your convenience. If you don't work on it, then you are not serious and you will no longer be allowed to train. Because my classes are small, you get individual attention, and all of my students know that they can call on me at anytime. In fact, because of this arrangement, my students tend to develop a much sounder attitude toward their training because they are truly training for themselves, for their own purposes. Our Association, our family, is built upon the strength of character in its members. This is not something that happens overnight. It is a process that is worked on over a period of time, but this is time well spent. The goal of the Association is to provide a solid base for the members to strive for achievement in four areas of personal development as Martial Artists. We view these areas, in fact, as our responsibility as Martial Artists, and they form the very cornerstone of Grandmaster's teaching. We first have a responsibility to gain awareness and control of our body. God gave us a mind as well as a body, and thus our second responsibility is to gain awareness and control of our mind. Third, we have a responsibility to directly correlate the activities of our body with that of our mind. Only the serious and dedicated practice of the Martial Arts can provide a vehicle or method of achieving this: it does no good to lift weights or to play football for our body, and to then pray or listen to Bach for our mind- there is no correlation there (except that perhaps we can pray that we win the football game!). Our Art, if practiced correctly, provides us with a process of direct mind/body integration, but this must be a learned process as it is one that is not readily self evident. And finally, our fourth responsibility as Martial Artists is to share our Art with the society around us; we must strive to make our society a better place for all of us to live, grow, and flourish in. We don't do this by helping old blind people across the street. Rather, we share our Art by our own process of right thinking and right living achieved through the dedicated practice of our Art as taught by Grandmaster. Developing the body is the task of the first one to two years of training taking the student to the 3rd Degree Brown Belt level. It is at 3rd Brown that the student has approximately 70% of the physical ability and strength that will be developed. To gain just 3% to 5% more ability could take 5 or more years; the point to be made is that those first years of training are dedicated to maximizing one's physical development to the greatest extent possible. At 3rd Degree Brown Belt, our Basic Meditation process is taught to the student. It is at this point that emphasis begins to shift toward mind and character development. Certainly body development continues, but further body development would not be possible were it not for the student learning more about their attitude, their character, and how to more correctly view the Nature around them. This mind development process is nurtured in the student over the course of the next 2 to 3 years of training culminating in achievement of 1st Degree Black Belt. The next 2 to 5 years are spent learning to directly correlate mind and body work into a unified process of personal self-development. This is a very difficult time for the student, and one that few are able to weather. Those who succeed, however, are brought into the White Cobra as 2nd Degree Black Belt Disciples of their Master. Their responsibility over the next 3 to 5 years of their training is to learn how to share their Art, their knowledge, their joy- their life. And the distinction must be understood between the concept of true sharing and just simply teaching: anyone can teach a monkey to dance, but only a Martial Artist can truly share their Art with another to make the other individual- and ultimately themselves- a better person for the experience. There is no higher purpose that we should strive for as human beings than to positively affect the life of another. And this is the task of the Disciple: to learn this critical piece to the puzzle for achieving happiness in life by sharing their Art with another person. Sharing that which we hold most dear to us is the key to unlocking the secrets of Nature for building strength of character and for experiencing the true joy of life itself. What is the first thing we want to do, for example, when we get home after seeing a really good movie? Don't we want tell someone who is close to us about it- to share our experience? The process of sharing our experience is the completion of our own enjoyment of that experience. And it is for this ultimate goal that C&S Self Defense Association was formed, and why it has been structured as it has. So, it's really about a lot of hard work and effort. Not many people really want to work that hard, or to be challenged at that level. But that's ok. Karate isn't for everyone, and the way that I teach it isn't for everyone, either. However, if this type of challenge excites you, then email me so we can set up a time to chat briefly about just what it is that we do in a full karate program. Having said that, if all you really need or want is some solid training and ability in self defense and positive attitude, I can make that happen for you in just 4 classes with our Basic Introduction to Self Defense Course. 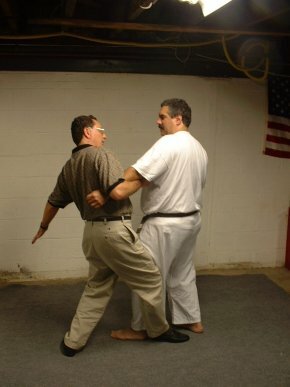 As amazing as it may sound, self defense is the easy part! If that's more to your interest, then email me, and I'll answer all of your questions. journey into the martial arts brings. our loved ones, our communities and ourselves. As a student in the Martial Arts Family, I train hard in our Art in order to make my body strong so that I can defend myself, my loved ones, and the weak. I practice our Art faithfully so that I may embody the spirit of the Five Maxims of: Character, Sincerity, Effort, Etiquette, and Self Control. And finally, I study our Art to come into harmony and peace with myself, my environment, and ultimately with all of nature. My Art is my Life. It is my way. Thus, I live my life as I study my Art.